Happy New Year everyone. Christmas came and went very quickly this year. I hope that you have been able to spend time with friends and family. 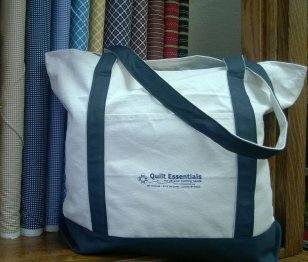 We still have QE canvas bags available. If you purchase a bag and bring it back into the shop beginning January 2016 you will receive a 10% discount on all your purchases of regularly priced fabric and notions throughout 2016. To celebrate the New Year we will have our annual Skinny bolt sale. All skinny bolts have been pulled from the wall and will be set up in the back of the store. There are all kinds of bolts from reproduction, juvenile, flannels and batiks marked down 20%. If you finish the bolt you will get 25% off the entire bolt. There is a minimum 1 yard purchase to receive the discount. The sale starts January 2 and runs through January 9. Time is running out to sign up for the 2016 Tonga Gemstones Block of the Month club. 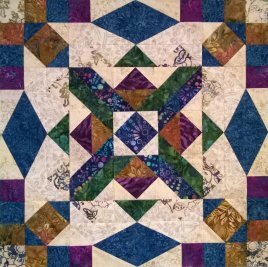 The quilt is from Wing and Prayer Design, featuring Timeless Treasure batiks. The club will begin meeting in January. Registration is $25 and there is a monthly fee of $25 for the fabric kit. Participants will receive a 10% discount on the club night on all regularly priced fabric and notions. Here is a sneak peak at some of the piecing. January 9th The Advanced Sampler club will meet at 9:30 a.m.
January 9th Join me at 10:30 a.m. for Second Saturday Sampler. We will be doing a perpetual Sampler with many options based on what you want to do. You will be required to buy a book, but that is it. We will use Judy Hopkins’ book “501 Rotary Cut Quilt Blocks” for the next year and possibly beyond. This way, if you miss a Saturday you will have the pattern no matter what. Patterns used will be listed on the website. January 14th from 5:30-7:30 the Tonga Gemstones Block of the Month club will meet. Participants will receive a 10% discount on the club night on all regularly priced fabric and notions. January 20th from 10:00-5:30 is Open Sew day. This day is for you; we’ll have the coffee pot on. Bring your sewing machine or hand work or just come by to chat a while. Finish up a project or start something new. There may even be an occasional free demo. We open at 10 am; come by any time during the day and stay for as long as you’d like. January 21st Join us for a monthly book club at Quilt Essentials. This month’s book is Nightingale, by Kristin Hannah. Come form friendships in the quilting community. January 26th from 2:00-4:00 is the “A” Team & Friend’s meeting. This fun group explores a variety of applique techniques to develop skills, enhance knowledge and keep advised of all the new products and techniques available to all who love to applique. Currently the “A” Team members are working on individual projects. There is no registration fee and participants may join any time.